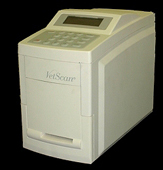 This is a VetScan Biochemistry Analyser. It is the centrepiece of our in-house laboratory, and produces rapid, accurate measurements of a wide range of blood tests. It is an in-valuable tool in our efforts to improve anaesthetic safety. Many of the problems encountered during anaesthesia are due to undiagnosed, pre-existing diseases. A comprehensive biochemistry profile run on the VetScan analyser allows us to detect many of the important organ failures before any drugs have been administered to the patient. This includes liver disease, kidney disease and diabetes among others. Urea and creatinine are waste products that the kidneys normally remove from the blood. ALT and ALP are enzymes (proteins) found inside liver cells. When the liver is damaged more is found in the blood than normal. A waste product normally removed by the liver. An enzyme made by the pancreas, which when damaged is released into the bloodstream. The main sugar found in the blood. These are minerals which have complicated mechanisms of regulation, but must be kept within strictly defined limits. The major proteins found in the blood are important for many body functions. Low albumin is especially dangerous during anaesthesia. A count of how many red cells are in the circulation. (This test is not performed by the VetScan machine, but is part of a pre-anaesthetic blood test). Testing urine also gives us valuable information about the liver and kidney.